The Sagarmala project has made huge progress in the last three years, but funding is a big constraint. Often, the huge scale of infrastructure projects can be a hurdle in itself. 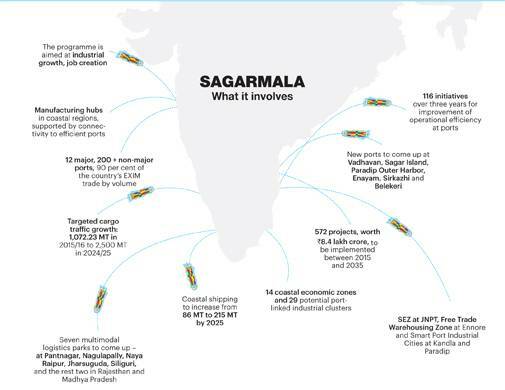 This is what is happening to Sagarmala - a project for port-led development by harnessing India's 7,500-km coastline, 14,500 km of navigable waterways and improving access to international maritime trade routes. Sagarmala has taken a number of strides in the last three years, but funding and lack of active participation from the private sector are proving to be major constraints in its timely progress. Until the end of 2017/18, 225 projects, valued at Rs2.38 lakh crore, were being implemented. Another 196, worth Rs71,868 crore, are likely to be awarded in 2018/19. In all, 98 projects, worth Rs31,046 crore, are expected to be completed in 2018/19. However, till March-end this year, only 59 projects, worth Rs11,299 crore, had been completed, according to a Ministry of Shipping statement. The total investment envisaged in the project is more than Rs8 lakh crore, but only 15-20 per cent port or other shipping infrastructure improvement projects are under way. The remaining are still at the "feasibility study" stage. Fund mobilisation, lack of interest from stakeholders in public-private partnership (PPP), ventures and an uncompetitive shipping industry are making implementation an uphill task. Notwithstanding the huge progress in building infrastructure over the last few years, India spends 19 per cent of its gross domestic product (GDP) on logistics, as against China's 12.5 per cent, Indonesia's 15.72 per cent and UK's 13.43 per cent. One reason why China spends less on logistics than India is waterways - waterway transport costs only Rs0.2-0.3 per tonne, while rail transport costs Rs1.2-1.5 per tonne and road movement Rs2-3 per tonne. Coastal and inland water transport accounts for a 25 per cent share in China; in India, it is just 2-3 per cent. In the planning stage since early 2000, Sagarmala envisages about 572 projects at an investment of over Rs8.4 lakh crore ($120 billion) over 20 years from 2015 - for port modernisation, port connectivity enhancement, port-linked industrialisation and coastal community development. A total of 39 PPP projects have been made operational at a cost of $2.21 billion (capacity of 240.72 million tonnes per annum (MTPA), says a report by the India Brand Equity Foundation (IBEF). Thirty-two PPP projects, with an estimated cost of $3.9 billion and capacity of 264.77 MTPA, are under implementation by companies such as Maersk, P&O Ports, Dubai Ports International, Adani Ports and Navyuga Ports. Proposed investments in major ports (12 in all) by 2020 alone are expected to be $18.6 billion, while those in non-major ports (about 200) would be $28.5 billion. The government has taken several steps to push these projects. First, it allowed foreign direct investment up to 100 per cent (under the automatic route) for constructing and maintaining ports and harbours. Then, it gave a 10-year tax holiday. Later, it created a Model Concession Agreement to promote transparency and uniformity in contractual agreements between major ports and bidders selected for Build, Operate and Transfer projects. It launched Project Unnati to improve efficiency. 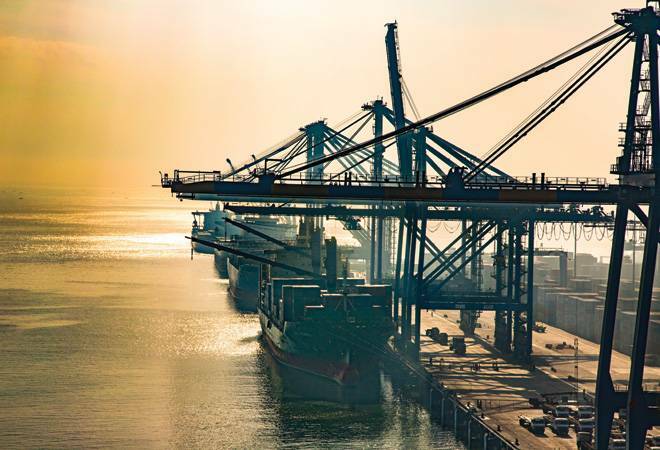 The Major Port Authorities Act, 2016 was passed to allow future PPP operators to fix tariffs and lease land for port-related use up to 40 years and for non-port related use up to 20 years. Projects are stuck because of issues related to fund mobilisation. A recent ICRA report says only 15-20 per cent of the projects are under implementation; the rest are at the feasibility study stage. Experts say more than creating new capacities, the need of the hour is to establish multimodal connectivity and increase capacities at existing ports. The 12 government-owned ports can handle 1,359 million tonnes (MT) cargo per year. They handled only 679.35 MT until March 2018, which meant a capacity utilisation rate of just 50 per cent. Cargo capacity in India rose to 2,493.1 MT in 2016/17 from 1,806.8 MT in 2014/15. The target is 3,130 MT by 2020. An IBEF report says in 2017/18, major ports in India handled 679.36 MT cargo, a compounded annual growth rate of 2.73 per cent between 2007/08 and 2017/18. In 2016/17, major and non-major ports handled 1,133.09 MT, an increase of 5.7 per cent from 2015/16. India's shipping industry needs to be made more competitive for Sagarmala to succeed, says Anil Devli, CEO, Indian National Ship Owners' Association. At present, Indian vessels are 39 per cent more expensive than the non-Indian vessels. Shipping industry and coastal shipping need to be incentivised through lower cargo tariffs. One option could be ensuring better rail-road-sea connectivity as the model of unified cargo movement is an emerging trend worldwide. That is why the Sagarmala plan includes 39 road projects to improve connectivity between major ports and highways. Once dedicated frieght corridors start, cargo volumes are bound to rise, say experts. Sanjay Sethi, MD and CEO, Nestor Consulting India, says, though many ports have added new terminals, global trade is languishing and the private sector's interest in PPP projects is tepid. "Also, most Indian shipyards are looking at defence orders and two major commercial ship-making yards - ABG Shipyard and Bharat Shipyard - are shut," says Devli. Shipping ministry officials met stakeholders in Mumbai this month and decided that some existing ports could be recognised on global shipping line routes with calls from mother ships. But this cannot hide the fact that the 2018/19 budgetary support for the project is a mere Rs600 crore. The ICRA report notes "significant challenges in terms of mobilisation of funding, especially towards the other two pillars of Sagarmala - development of industrial clusters and coastal communities, where progress has been limited." Funds committed for these projects were mostly from private sector banks and they are no longer funding such projects, says Sethi and adds that "many projects announced a couple of years back are struggling to reach financial closure". Everyone agrees that if the vision and goals of Sagarmala are implemented in time, India will change big time. But it will not be easy.